To Grove Taxidermy in Creve Coeur. I kind of gave that away in the first sentence. So that was easy, but pay attention, there’s a pop quiz at the end. I love the log cabin design of this place. Let’s mosey in through the screen door and see what’s happening inside. Wow, it’s crazy cool in here. I can’t capture the look and feel of it with my limited photo skills, you should really stop in here and take a look around in person. This is Vinny, who’s the son-in-law of Harley Grove who owns the shop and has been in business here since 1962. Vinny’s a nice guy and he said I could wander around and take photos, so wander we shall! The work here is insanely good. Everything is a work of art. Maybe I’m just paranoid, but I think those two on the left are staring at me. A shot from the back of the shop. This buffalo head dwarfs the deer on either side. Georgia O’Keefe meets the Wizard of Oz over in this corner. I love how this little critter is on the prowl! That boar down there in the lower right looks stoned. Maybe he’s stuffed with wacky tobacky. It’s really cool to look at the work in here. You can see why they’ve been in business for over 50 years. Vinny says they don’t do skunks in here, so maybe this guy just wandered in. He also told me that every animal has its own season. The summer is big for fish, if you want to get your whopper mounted, this is the place to go. There’s a joke in there somewhere, but it’s too early in the morning for me to figure it out. Maybe later this afternoon, but probably not, let’s just keep moving along. I couldn’t get a good shot of these, but they’re chandeliers made of deer antlers, very cool! Ha! 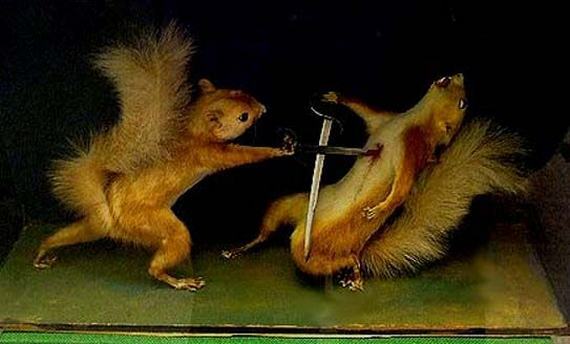 A squirrel that shoots back! Gumby’s found a new pal! Here’s the office area of the shop. Pelts hang over in this corner here. Not everything in here is stuffed, check out this wooden carved owl. This is the owner, Harley Grove on the front page of the PJ Star regarding the Creve Coeur Streetscape Project. Here’s a box of arrowheads for 75 cents a pop, not a bad deal at all! This is a display of some cool and unique knives in the back of the shop. I got the Dale Evans knife. Thanks to Vinny for being a gracious host and letting me take pictures of a unique and interesting shop in the area. You should stop by and check it out yourself! We’ll see you all tomorrow! Related Post: Shop Hop @ Aquarium Obsessions, Flores Music and Acme Comics. 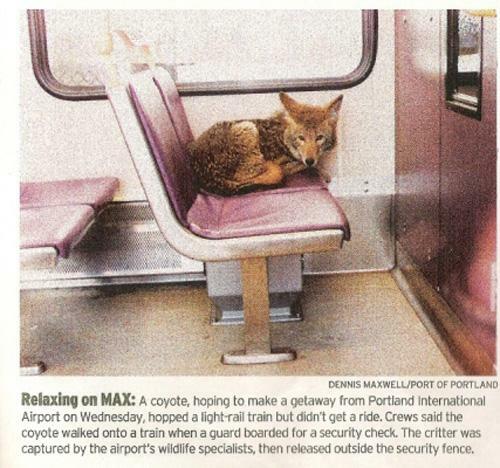 And hops on the Light-Rail Max. Bonus Stuffed Head From Jaws The Cabbie! Jaws the Cabbie found this vintage ad online, equal parts creepy and cool! Thanks, Jaws!